The show begins with a new “Then, Now, Forever” intro. Baron Corbin is waiting as a limo pulls up. Stephanie McMahon and Triple H step out of the limo. Corbin wishes Steph a happy birthday, but she’s not happy. Triple H excuses himself while Stephanie starts in on Corbin. She is upset that Corbin has been a terrible leader in Kurt Angle’s absence. Corbin makes excuses, but Steph doesn’t want to hear it. She tells Corbin to get a couple partners because he’s having a match with The Shield tonight so he can take care of his business. The Shield heads to the ring. Dean Ambrose says The Shield might have lost a few battles over the years, but they’ve never lost a war. Roman Reigns gets booed as he talks about The Shield’s championships being the keys to the kingdom. 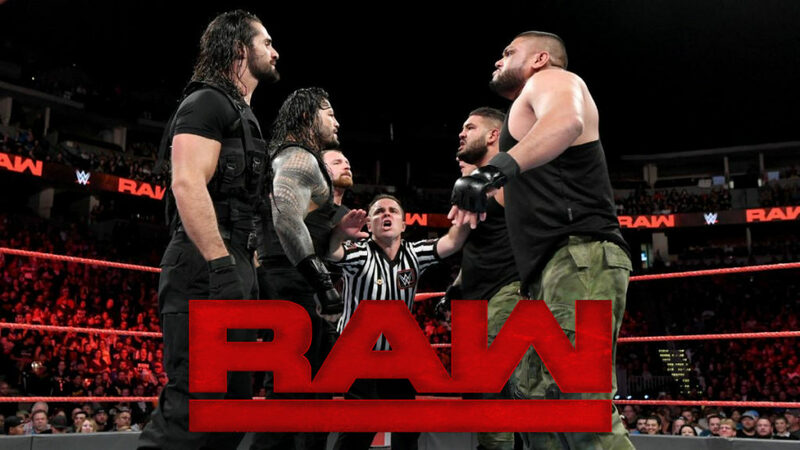 Seth Rollins says that even with backup, Braun Strowman can’t defeat The Shield. He also invites Baron Corbin to come down to the ring so they can settle their differences right now. Baron Corbin comes out to the stage. Corbin puts his foot down by saying tonight will not erupt into chaos. He also intends to impress his boss Stephanie McMahon. Corbin goes on to say that no one likes The Shield, including then men joining him on the stage right now. Braun Strowman, Dolph Ziggler, and Drew McIntyre come out to the stage. Strowman says he can already see cracks in The Shield. They are going to collapse from the inside, and Strowman thinks Ambrose is the one who will turn. Ziggler points out that Ambrose is the only member of The Shield without a title. McIntyre says Ambrose pushed him to the limit last week. Rollins and Reigns don’t appreciate Ambrose, and he deserves more. Ziggler adds that Ambrose sacrificed himself so Rollins could be IC Champ, and he sacrificed himself so Reigns could keep his title. Ziggler also points out that Rollins replaced Ambrose with Jason Jordan very quickly after he got injured. Ziggler tells Ambrose that if he joins himself, McIntyre, and Strowman, then the IC Title will be his. Reigns tells Ziggler to shut up. Reigns would rather fight than talk. Ziggler, McIntyre, and Strowman head down the ramp, but Corbin stops them. He doesn’t want a brawl, and he says he and his partners will take care of The Shield later tonight. Bayley gives Finn Balor a hug as he prepares for a match. This was fun. The match was going fine, but it wasn’t until Alicia Fox tried to trip Balor that things got interesting. Bayley tripped Mahal, and Fox wasn’t happy about that. The scuffle at ringside involving Bayley, Fox, and Sunil Singh was fun and led to the finish in the ring. This was tough to watch. Brie Bella spent most of the time in the ring for her team, and she seemed really off tonight. To start, she wasn’t watching what she was doing when she attacked Morgan with the Yes Kicks, and she kicked Morgan in the face twice. Morgan was nearly knocked out, and she was pretty much done for the rest of the match. Brie was also involved in some strange moments where it seemed communication had broken down. Ruby and Sarah Logan did what they could, but it seemed everyone just wanted to get to the end of the match. Superstars line the stage while Stephanie McMahon and Triple H are in the ring. Stephanie talks about the money the WWE Universe has raised for Connor’s Kids. Triple H talks about some of the kids they’ve met recently, and Stephanie introduces a video about Hyundai joining Connor’s Kids. After the video, Stephanie introduces Carter and Elizabeth. The kids are given replica title belts, and a representative from Hyundai gives $200,000 to Connor’s Cure. Dolph Ziggler tells Dean Ambrose the he knows what Ambrose can do. He saw it when they were both on SmackDown together. Ziggler says Ambrose doesn’t have to do anything tonight. Ziggler says he’ll wait for Ambrose’s signal for himself, McIntyre, and Strowman to attack Rollins and Reigns. This was short, but it was interesting. Gable looked good as he usually does, but Konnor’s power game looked good as well. I feel like the finish here is going to play into the Roode/Gable story, but it was still a little surprising. Maybe The Ascension will actually start winning some matches on RAW now? Charly Caruso would like a word from Triple H about what The Undertaker said last week. Triple H isn’t worried about The Undertaker stealing his soul. Triple H sold his soul a long time ago. Good match. It ultimately felt like a blow-off of The Revival so Ziggler and McIntyre can move on to other things (or keep moving on as the case is), but I still enjoyed the match. It was pretty even at first, but The Revival started to dominate late in the match. Dawson and Wilder looked great as a team and hit some big moves. Unfortunately, it never really felt like they had a chance to win considering the story Ziggler and McIntyre are involved in. In the ring, Elias doesn’t think Denver deserves a live performance tonight. So instead, Elias introduces the host of The Kevin Owens Show, Kevin Owens. Owens heads to the ring. Owens says he is Elias’ biggest fan, and he’s happy to be teaming with Elias at Super Show-Down. Owens talks about what happened last week when Lio Rush starting talking about him last week. Owens didn’t appreciate being talked to like that unprovoked, but he would like to give Rush a chance to explain himself. Owens invites Rush down to the ring. Lio Rush comes out to the stage. Owens wants Rush to enter the ring, but he doesn’t. Rush talks about how he and Bobby Lashley made Owens and Elias look foolish last week. Elias assures Rush that he will be okay if he gets in the ring. Elias even has a booster seat ready for Rush. Rush thinks that’s funny. He then introduces Bobby Lashley. This was okay. It was kind of slow and uneventful, but there wasn’t anything really wrong with it. After the match, Kevin Owens chases Lio Rush. Rush evades with speed and jumps, but he gets caught by Owens in the middle of the ring. Owens goes for a powerbomb, but Lashley stops Owens and sets Rush down. Owens tries to hit Lashley but gets punched himself. Owens leaves the ring and heads up the ramp with Elias. Seth Rollins tells Drew McIntyre that the truth is, McIntyre is being used by Braun Strowman and Dolph Ziggler. McIntyre literally carried Ziggler after their match at Hell in a Cell. Rollins walks away as Ziggler walks up. Ziggler asks McIntyre what Rollins said, but McIntyre tells ZIggler not to worry about it. Alicia Fox got a few good strikes in, but Nia Jax was dominant in this short match. It was fine, but it seemed more like a “welcome back” match than anything else. Drew McIntyre approaches Dean Ambrose and wonders why Seth Rollins would says what he did to him. He thinks maybe Rollins is looking to replace Ambrose. It’s not like Rollins has ever betrayed Ambrose before, right? A hype video for Undertaker versus Triple H at Super Show-Down. The Shield heads to the ring for a match. Baron Corbin comes out next. From the stage, Corbin introduces his partners for the Main event: the Authors of Pain. Corbin, AoP, and Drake Maverick head to the ring. Before the match begins, Braun Strowman, Dolph Ziggler, and Drew McIntyre come out to the stage. They set up a trio of chairs and sit down to watch the main event. Good match. The whole story line of teasing a possible Ambrose defection didn’t really have an effect on anything in the match, but that’s fine. The match was fine. I liked the buildup to the finish (chaos and stuff), but the finish itself was a bit underwhelming. I did like seeing AoP in the main event. I’m still not a huge fan of theirs, but I think they work better in situations like this than in a lot of the regular tag matches they’ve been in. Seeing them steamroll guys less than half their size isn’t entertaining for me, but seeing them struggle with The Shield is better. After the match, Dean Ambrose kneels down outside the ring by himself. He stares at Strowman, Ziggler, and McIntyre for a few seconds before sliding into the ring to join Rollins and Reigns. I liked that they carried the Ambrose story throughout the entire show, but I don’t feel like it had much of a payoff. Maybe this will add tension for their Super Show-Down match if they bring it back up during the match somehow (like Ambrose getting into situations that question his loyalty), but it didn’t do a whole lot for the main event. The rest of the show was just okay. The six-woman match was tough to watch, the tag title match felt inevitable, and the rest of the matches didn’t have a whole lot to them. The other story segments didn’t move anything forward very much. As much as I didn’t ever feel like The Revival had a chance, this was probably still my favorite match tonight. The Revival is great, and hopefully they’ll get their chance to shine on the main roster at some point.